Thousands of troops have been deployed across the country, which will once again bear witness to an election under the awesome shadow of the soldier’s gun, recalling the experience of January 2014. 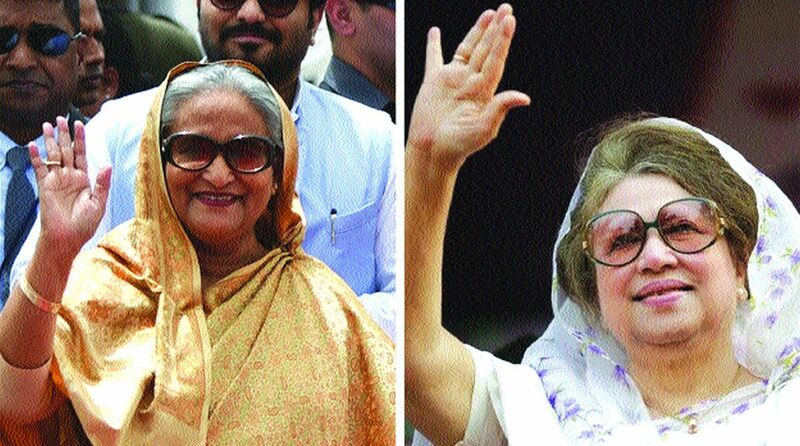 Prime Minister of Bangladesh Sheikh Hasina (Left) and Former Prime Minister of Bangladesh Khaleda Zia (Right). As Bangladesh gears up for its eleventh parliamentary election this Sunday, 30 December, the next government in Dhaka will be on a weak wicket on the diplomatic front. On the face of it, it is the international election monitors who have suffered a setback, given the out-of-bounds policy of the Awami League administration. That fatwa in itself is suggestive of its intent to keep the sensitive details of the tryst with democracy under wraps. Judging by the contours of Bangladesh politics, it is almost certain that Begum Hasina’s party will be at the helm yet again, this time through a contested election. The decision not to allow election monitors from abroad to set foot on the tarmac, as it were, flies in the face of the government’s commitment to allow international observers for the sake of a credible election. The backtracking, therefore, is unacceptable. Effective monitoring is central to the conduct of an election, and this is no less crucial than summoning the troops on polling day, a decision that has been welcomed by Begum Hasina’s bete noire, Begum Khaleda’s Bangladesh Nationalist Party. Thousands of troops have been deployed across the country, which will once again bear witness to an election under the awesome shadow of the soldier’s gun, recalling the experience of January 2014. Which in itself is testament to the inherently volatile situation. The critical difference being that the Asian Network for Free Elections (ANFREL) has been forced to cancel its observation mission for the election after the government failed to issue visas within the stipulated timeframe to the majority of its international monitors. Rightly has the US, which funded the ANFREL mission, expressed its disappointment. Theoretically, a country’s “inability” (aka refusal) to issue visas for such a mission is usually deemed as rejection. The visa-delay was nothing if not deliberate. While ANFREL’s mission has been stopped in its tracks, the European Union ~ with Brexit uppermost on its agenda ~ will not send a team this time around. Barring a few international observers, the critical task of monitoring now devolves on “local observers”, who will quite obviously be handpicked by the incumbent ruling party. Furthermore, the government has put in place crippling curbs on their functioning, chiefly a bar on taking photographs inside a polling station or even interacting with the media. The election will, therefore, be “observed” on the terms of the Awami government and favourable observations can well be expected. The functioning of the Election Commission is under a cloud even before the first vote is cast. It has failed to ensure what they call a “level playing field”, indeed to protect the Opposition from random arrests, violence, and “ghost” cases. Monday’s attack on journalists with hockey sticks at Nawabganj, near Dhaka, exemplifies the inherent volatility. The plot thickens with the EC’s green signal to the fundamentalist Jamaat ~ an ally of the BNP ~ to contest the elections.